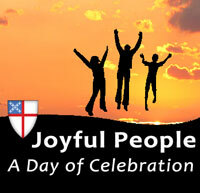 My friend Diane Duntley has been working hard to put together an exciting day of workshops for the diocese titled Joyful People: A Day of Celebration, but she tells me that registrations are coming in slowly. The event is a week from tomorrow (i.e., Saturday, May 7), so it is important to register soon. Complete information is available on the diocesan Web site here. The event begins in the morning and ends mid-afternoon with an ice cream social. There are workshops on stewardship, altar guild, end-of-life issues, prayer, Episcopal Church issues, vergers, hunger, and more. There is child care available and a youth program. Registration is only $10, with a discount for families. Lunch and ice cream alone should be worth the $10! Diane tells me that the diocese used to sponsor such events and attract many registrants. During the Duncan years, the tradition continued, but the topics treated in workshops were far from the Episcopal mainstream, and the events were largely attended by people who are no longer Episcopalians. It is time for Episcopalians to come together and learn as a diocese and for Episcopalians in our many churches to get to know one another better. Do consider participating in Joyful People. Register today!